« A Dow Theory Buy Signal? After losing 5.72% for the month of August, the S&P 500 ended August below its 10-month moving average and also below its 12-month moving average (using either a simple or an exponential moving average). The blue line is the EMA, while the two horizontal lines indicate the entry and the exit levels. 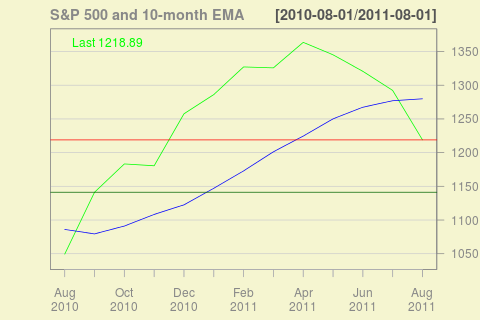 It is clear that a strategy based on the 10-month EMA would have captured only a small amount of the upside move. The opposite crossover happened 11 months (at the end of September, 2010) ago and a position would have netted about a 6.81% gain. However, the trade turned negative (!) in the middle of the month, but then markets turned up and recovered some of the gains. The next chart zooms into the daily fluctuations for this period. To me this crossover looks like a delayed whipsaw – it will soon reverse on a higher buy. On the other hand, according to the MarketSci blog, September has consistently been a bad month, so it might be a smart decision to avoid it. Only the future will tell however whether the next crossover is going to be at a higher or lower price. In any case, considering today’s inflation situation, 6.81% over 11 months is certainly a very decent return. It is hard to deny the success of long term moving average strategies, although I would admit that the 10-month MA extraordinary performance is a mere curve fitting. August was a really interesting month from the point of view of the Dow Theory. Earlier in the month we got a Dow Theory sell signal. Then, we got what Schannep calls capitulation typical for bottoming markets. Finally, two days ago we got a buy signal again according to the Schannep’s version of the Dow Theory. Notice however that looking at the classical Dow Theory we are still in “out-of-the-market” situation because the Dow Jones Transports average hasn’t confirmed the bull signal given by the Dow Jones Industrials. All in all a very interesting, although a bit scary, month. 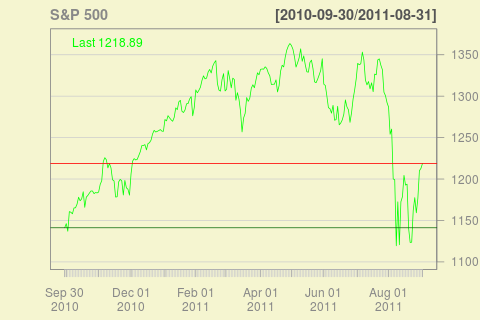 This entry was posted on Sep 1, 2011 at 1:11 am	and is filed under Market Timing. You can follow any responses to this entry through the RSS 2.0 feed. You can leave a response, or trackback from your own site. Can you add the r codes to your articles as well,please? Assuming that’s a request for the charts code – I will start adding the R code from now on.